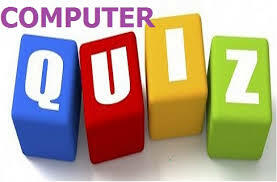 Dear Readers, we are presenting Computer Quiz for IBPS Clerk Mains, India Post, NIACL and other exams. Computer section play important role in scoring. 2). A printer is this kind of device ________. 4). The name of the computer's brain is _______. 5). A(n) _________ is a device that electronically process data, converting it to information. 6). Which of the following are computers that can be carried around easily? 7). The secret code that restricts entry to some programs _______. 8). The basic goal of computer process is to convert data into _______. 9). Where is the disk put in a computer? 10). A hard copy of a document is ________.